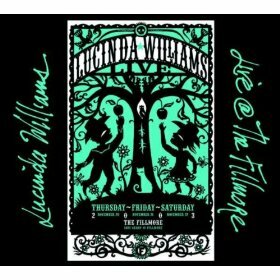 Live At The Fillmore is a live album by Lucinda Williams. It was recorded at the Fillmore West in San Francisco on the 20, 21 and 22 November 2003 but not released until May 2005. The son choice, mainly from the two preceding albums, suggests that she’s not in a happy, good place. iTunes offers a Live @the Fillmore EP with four extra songs. This is a raw, emotional trip through her songs of painful emotions and it’s delivered in a thrilling, high intensity way that almost forces you to listen to every word and to join her in the feelings. While you may think of Lucinda Willams as a fairly gentle country rock singer, this album will force you to abandon those thoughts. She and her band rock in a very compelling way. This has featured in several of the critics best live albums lists. It’s also very much appreciated at Amazon. Do you think that this album is the best Lucinda Williams live album? This album is included in two polls – the best singer songwriter live albums and the best country rock live albums. Because there are so many good live albums by singer-songwriters, I have a second division poll where your votes will promote an album. This entry was posted in 2000s Live Albums, Country Rock Live Albums, Singer Songwriter Live Albums and tagged 2000s Country Rock, 2000s Songwriters, 2003 live albums, Lucinda Williams Live Albums, SS W by Paul Simister. Bookmark the permalink.